I have been traveling in Europe and working most of the time that I have been here. When I return, I will have been in Europe for six weeks total. My travels have brought me to France, Italy, Andorra, Monaco, Lichtenstein, and Switzerland. It has been interesting and challenging to say the least. First, since I wanted to work on Eastern Standard Time, from 8am to about 5pm. This meant working from 2pm to 11pm during my stay. I would spend time either relaxing or touring in the morning, then eat lunch, and then get ready for work. It was not hard to get used to the late hours, but there were other challenges. I decided that I wanted to work from co-working spaces as often as I could. This was because of the “office” atmosphere” and the access to better technology, like printers and high speed internet. Not to say working at the apartments I stayed at was not desirable. Some of the locations had great views or wonderful character. 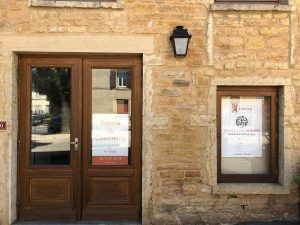 While in Carcassone, France, I worked at Le 302. This was a co-working facility nestled in a shuttered auto dealership. For the most part, the workspace had an open floor plan and a few offices. There was no air conditioning, so it got very warm on the days where the temperature reached over 90 degrees. The manager did buy some misting fans to helps some, and they were welcomed. I have found that most of France does not have air conditioning. My apartments did not have AC and most office buildings seemed to be similar. Some retail shops and restaurants might have AC, but they are not the norm. Each time I went in to Le 302, I would choose a desk for the day (sitting or standing). At times, the proximity to a fan was a determining factor. I would unpack my bag with my bare essentials; my MacBook Air, notebook, tech organizer, power cords and electrical adapter, and get set up. I really missed my at home set-up of my MacBook Pro, triple monitor screens, very high speed internet, comfortable chair and freezing air-conditioner temperatures. When I needed help, it was challenging because no one really spoke English. One of my fellow “co-workers” spoke English and would help if he was there. I did find that the manager spoke Spanish, and we decided that was the best way for us to communicate. I then moved on to Le Castelette, in the Provence Region of France, where I worked at two co-working locations. La Cantine by TVT in Toulon and Spotee in Eguilles. Both of these locations offered late hours, which was what I needed to accommodate the East Coast, USA work schedule. TVT was in a large city and had one large open work area and everyone seemed to be heads down working efficiently. I did not notice anyone making phone calls, which is something that I needed to do. I was told by a manager that I could use a phone room down the hall. I used it a couple of times while I was there. As for Spottee, it was a charming, converted house turned into a co-working space. They had air conditioning! They also had other offerings, such as a fridge, microwaves, coffee machine, and an outdoor work area. I was even greeted by the office dog, Nuts. 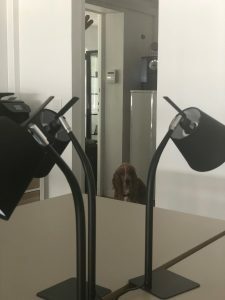 He seemed to be a good supervisor, watching me work. I found that I could work in a room with a small amount of people and making phone calls was not an issue. 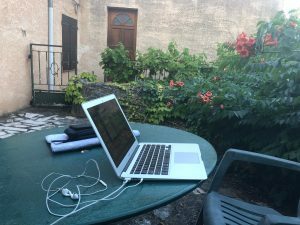 This was my favorite working space of the trip and I highly recommend checking it out if you are near Aix en Provence. 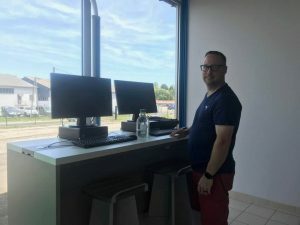 In the Beaujolais region of France, I have found that there are only a handful of co-working options. If I want to travel an hour to Lyon, there are plenty of options, but our family only has one rental car and it’s difficult to make this work. I did some research over the weekend and emailed a few of the locations that appealed to me. I could have taken the train to Lyon for about $10, but that would add to my costs and would add almost two hours to my “commute” or I could have my family drop me off and pick me up at a closer space. After I received some replies and narrowed my choices down to two semi-local locations, my first priority was proximity to my apartment, then price. The cost of co-working in France can vary greatly. I found the range to be from $4 to around $50 a day. Who would pay $50 for one day? Don’t be afraid to negotiate. At times, you might be able to obtain a deal and my motto is, “The answer is always no if you don’t ask”. I was able to get special pricing to meet my needs at several locations throughout France. 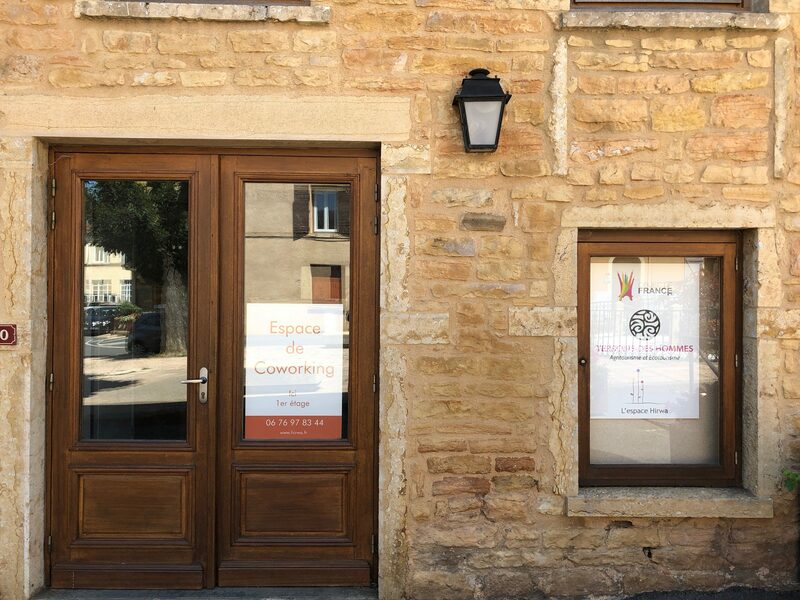 The first location in Beaujolais I chose was Coworking 362. I was told that I could stop by and check the place out on Monday afternoon, but when I arrived the door was locked and I could not get in. I called the phone number on the website and the owner told me that they were on the road and could not meet with me. I returned a few days later to try it out again and the Internet was not fast enough to be able to facilitate video calls, so I went to another location. Businesses are not always run the same way in foreign countries, so it’s best to adjust your expectations to meet that culture of the place you are visiting. In France, closing unexpectedly is very normal. Expect that businesses will also be closed between noon and 2pm for an extended lunch. It’s also very good advice to ask for a speed test on the internet to be done prior to showing up at the office space. This may not always be possible, so do your speed test at the earliest when you arrive. The location that I ended up working at was Hirwa, located in Lacerne, France. It is actually a travel company that is also a co-working location. The owner has a large office and decided to rent out work space to make some extra money. I love supporting a smart entrepreneur. The internet was good enough for my needs and they had coffee, water, printer, bathroom and a refrigerator. The building is old, and the walls were very thick, which kept the office pretty cool on hot days. For the most part, I was the last one in the office since most other folks were from France and worked normal business hours. People left early on the days that France was playing in the World Cup. You might be wondering what I did with the two weeks that I did not work. Well, I spend that time in Switzerland, Genoa Italy, and Paris. Switzerland had some of the most beautiful views that I have ever seen in my life, Genoa offered top notch pizza, and Paris is , well, Paris! Do research on where you want to work. Google Chrome is great since it will translate websites into English for you. You will be able to find locations, pricing, and use the contact us form and email addresses to reach out with questions. Do not solely rely on Google Map or Apple Map searches because not all co-working spaces are listed there. Use a simple Google search for “coworking” and the area you need to work. Tourist offices are also helpful and might be able to point you in the right direction. You can also Facebook Messenger to communicate with some of the locations that you have in mind. I did this with Spotee and they were very helpful and responsive! Use your cell phone as a back-up. If you are going to be in Europe for more than a couple of weeks, I highly encourage you to use a local provider. While in France, I used Free.fr. The service was a little spotty, but worked for what I needed. Also is was only $20 a month. If you need better service, you can look into Orange or SFR. I did have an issue with Free where I was charged $50 for data overages in Andorra. I had Google Maps up and turned it off just as I went over the border, but was charged anyway. I was not able to get any resolve by calling them, as they do not speak English. If you are going to travel to another country, research the providers in that country. Overall, I found it pretty easy to work while traveling. Depending on your needs, a co-working place may be the way to go. For me, I could not always count on having high speed internet at the AirBNBs or Gites, as they are called in France. It was also good to be able to get away from the apartment and interact with other people. What has been you most interesting co-working experience?